My Final Frontier, with the Fairy Bra Mother. Let’s just start by my introducing myself. My name is Elaine and I have been sewing some 50 years. My mom would not let me use her sewing machine until I was 11. She was afraid I would wreck it. She did not understand my drive to sew and the fact that I did understand what she was doing and was learning. My first project was a set of Barbie Doll clothes for my sister’s doll that Christmas and my second was a Muskrat Fur Coat for that same doll, with a bit of real fur. I must have been fearless to have tackled real fur! Karen still has that little fur coat. Why then, after all of these years of sewing have I failed to make a bra? Fear? Procrastination? For some reason, I thought it would be too hard. Enter Beverly Johnson. This dynamite of a woman from Hamilton, Ontario, Canada, comes every year to the middle of nowhere, Humbolt, Saskatchewan, for many days of classes and sewing. Last year, I signed up for her bathing suit class. Somehow that seemed like something I could do. Not hard like a bra. BUT…we had to make a bra for the inside of our bathing suit. Why, oh why, did I not take her bra class first?! So when her Craftsy Class was announced, I jumped at the chance! I have taken many Craftsy classes, some I have enjoyed and some not so much. However, this class was exceptionally well done. Beverly is clear, speaks directly to you, and makes you believe that you can get this done. Her speaking voice is easy and she speaks with such humor. She walks you through the measuring and how to select the pattern. She advertises her own pattern line, but also mentions a few others so you do not have to buy her pattern to get this done. 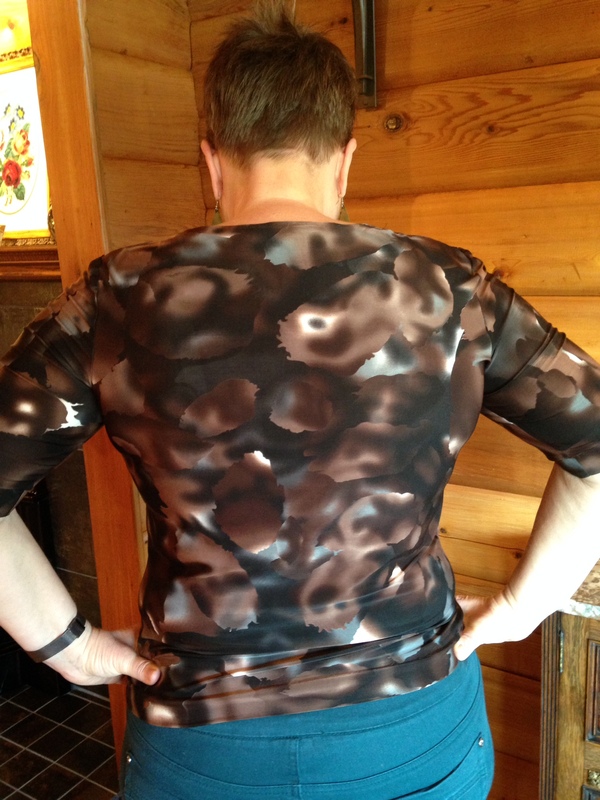 Her pattern line includes many many sizes from 32AAA to 48 H! She talks to you as if you are friends and she really wants you to succeed. In her patterns, your size is chosen based on your high bust measurement – my high bust is 41 and full bust is 45, and Beverly says to size up to even numbers, which would put me in a 42D. However, I decided to go with a 40D and add across the back for my broad back. At each step along the way, she talks you through the sewing process and demonstrates the sewing. She shows you her way of doing it and gives you options, should you like to try your way instead (Though, FYI: Her way is usually the right way). Then, when your first bra is finished she helps to critique the fit. She will show you, step by step, the problems along the way and how to fix it for the next bra. Sloping shoulders, pointy cups, too tight , too loose, how to tweak it to get it perfectly fitting. Once fit is perfect, she will discuss ideas on how to make it pretty. Lace, alternate fabrics, elastics etc. The only thing she forgot to say is that it’s addictive. I think that all women need bras that fit, but for those of us that are on the plus side of life, we NEED bras that flatter our curves. We can alter them to fit the same way we any other garment can be altered. When the bra is right, everything else is right. 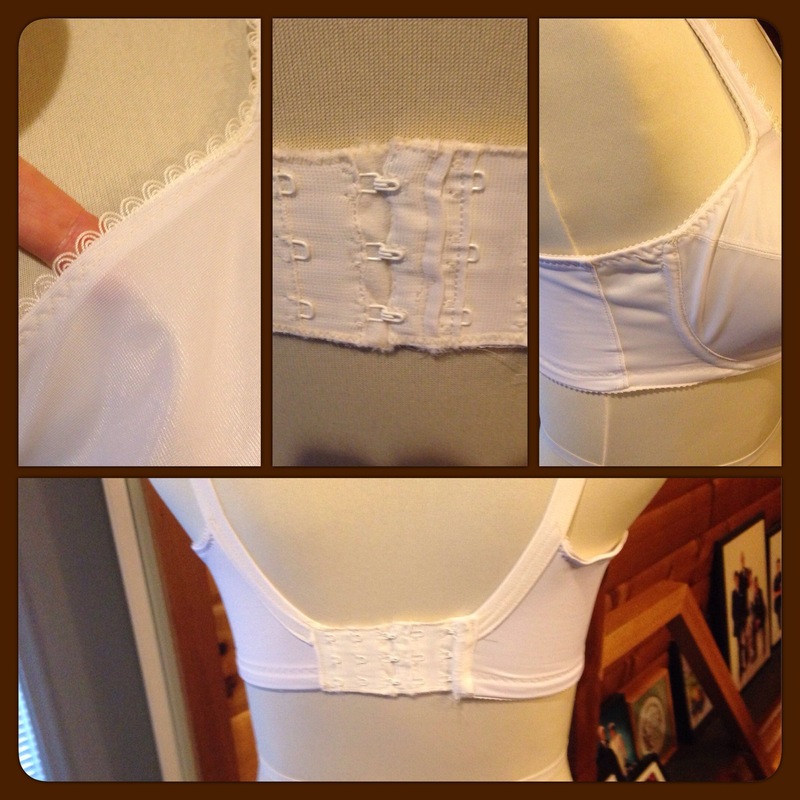 First muslin attempt – note the bra extender used to make it wearable. Finger is where it was snug at the top, but it fits me much better than on my Peggy. I made the following alterations for my second bra: the top of the bra cup was a bit snug, so I added the wedge where she said to make it. The back band was too small for my wide stooping shoulders, so I added what she said I needed. I also decided I wanted a wider back band and a bit more coverage under my armpit. This was the same alteration I did to her bathing suit pattern last summer. I also decided that I wanted to use a double layer of powernet in the back, and I moved the back should strap slightly in towards the spine. This keeps my straps on my shoulder, instead of always falling down. For my third bra, I just added 1/8 inch at the center front to give myself an extra ¼ inch between the girls. I also dropped the plunge in the front by a ¼ inch. 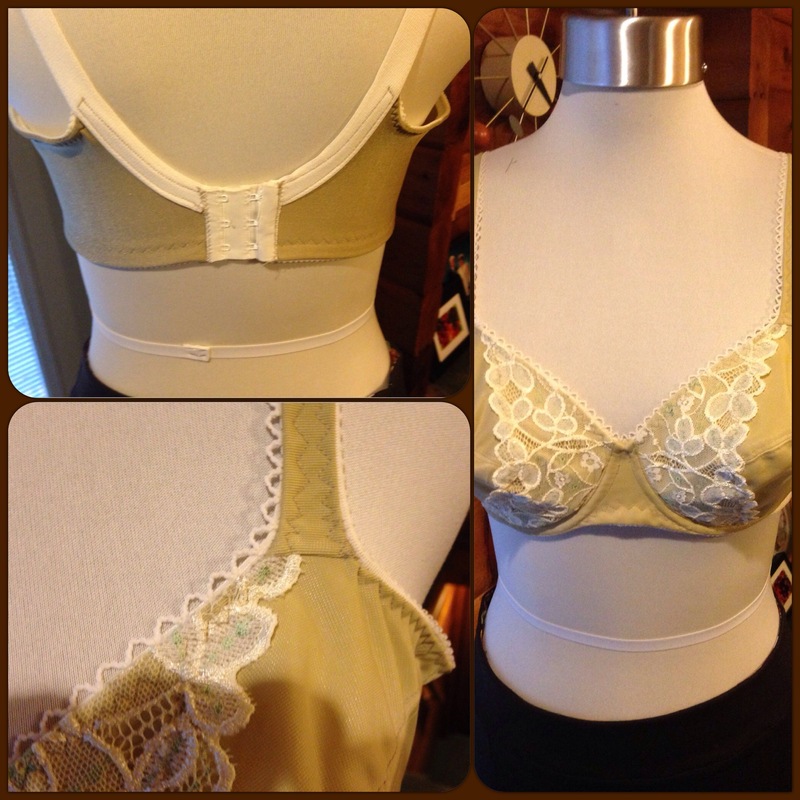 The plan for the next bra is to move the front shoulder strap slightly, maybe ¼ inch to the center. I might also try copying the strap of a ready to wear and add a small amount of padding. Now my girls are happy and content, they do not bounce, and my “back muffin tops” are controlled. I figure each bra costs me approximately $35 Canadian, when buying the little kits and findings. Also, don’t forget the under wires! The Canadian dollar is down to $.90 US making it a bit easier to take if you decide to order from Beverly directly. So I would highly recommend buying her class and also purchasing her bundles, with the pattern and everything you will need to finish your first bra. Beverly says, if you can set in a sleeve, and you can sew a reasonably straight line, you can do this. You need to figure out an accurate ¼ “seam allowance. It would be helpful if your machine can zig-zag and also has the triple zig-zag stitch. We can all do this. The only other thing I can say is that I had skipped stitches at first but when I changed needles to a 75/11 STRETCH needle, that all went away. I have now gone to MY FINAL FRONTIER. If you’re interested in signing up for the Craftsy class, you can sign up with a discount at Beverly’s website, https://www.bramakerssupply.com. 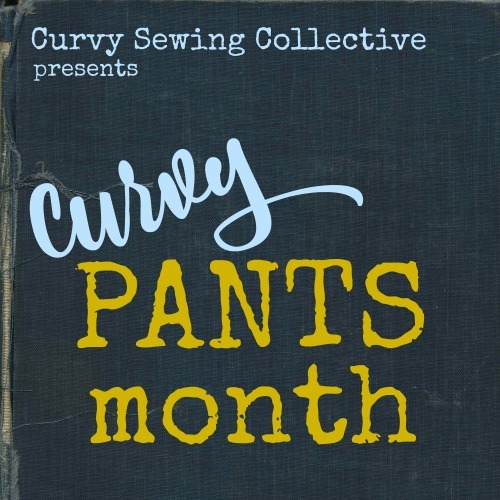 This review was in no way sponsored by either Craftsy or Beverly, but is instead an honest look at the class from a real live, curvy purchaser. It really is an awesome idea! I have had to do some work on bras I bought in stores before just because they would wear out or not fit right. Sometimes I would not have the money to buy a new one for a while so had to make do with what I have for awhile. I do not use a machine either. Everything I have ever made has been done by hand. I find it more fun that way. This class is amazing, I have to say. She goes over so many ways to alter a bra to fix fit issues and is great about providing information and help. 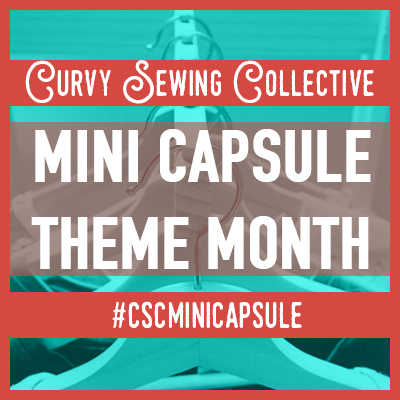 Her second Craftsy class covers even more alterations, especially things like splitting cups if you need a little more room or curve for your breasts or adjusting the apex if you’re pointing in different directions, and making padded straps. I enjoyed Beverly’s craftsy class also, and learned some new pointers, even though I’ve been sewing bras for years and have most of her books – I am addicted to learning about bra sewing! I highly recommend Beverly’s Shelley bra pattern – it is wonderful for large cup sizes (I ended up with a 32H). I also highly recommend the bravobellabras Bravo 2 pattern (also available as a PDF), along with Monica Bravo’s DVD for bra fitting. Monica’s fitting video is more detailed and shows live models being properly fitted. She also has an excellent bra sewing video. I signed up for the class but haven’t had time to step by step through it. I have made a bra before, but want to up my skills. Thanks for the great review and encouragement that I CAN DO IT! Hooray! 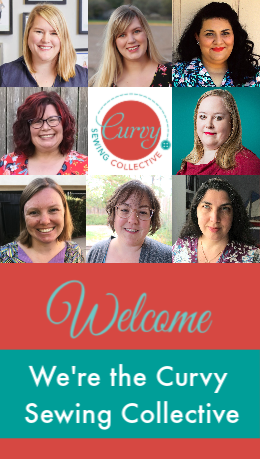 I have been hoping and wishing for Craftsy to have a bra-making class and now it’s here! Your post made my day. And your bra looks great on you. Wonderful post and great job on your finished bra. Because of your post, I went to the instructor’s website and signed up for the class (and a duffle bag class and kit, and a pattern for a wristlet bag, but that’s only because I’m a Craftsy addict)! Bras for me are ALWAYS over $100. So, hopefully this class will enable me to make my own well-fitting bras that don’t cost a fortune. I have never even thought about making my own bra before. I have been very unhappy with the fit of RTW, but thought that was just the way things are. Thank you for your pics and review! Beautiful job! I am actually midway through the class. I’ve also purchased supplies from this shop more than a year ago and even worked up a muslin. Finishing is the worst for me! Thank you all for your comments! It does help as I have never posted pictures before to the internet in my bra that this feels like such a safe community of people who will not judge your shape or size. First off, huge kudos to you for actually showing us the finished product on. Brave woman you are, and congratulations to you for conquering your final frontier. I think the green bra is beautiful. I am going to have to conquer pants before I can move on to bras. Though I have made other underthings. I bought the kit and the book and signed up the the class when it was first available. The one note I had was she does do some of the steps in a different order in the class then in the book. The class is great and you are correct it is addicting. Now for me personally I did not not get a good support from this bra, but I am not giving up. Here in the U.S. She has an affiliate in California, and they are great to work with took us three weeks of corespondening and returns to figure out the correct wire size I needed but we did in the end. I was like you, and thought for what ever reason the bra making is difficult it is not, though the fitting does take some time to get it correct. Glad you gave this review and hope others wil give bra making and this class a try. Best class ever!! I am making my first bra right now and it is SO easy. Definitely recommend this class to anyone, but especially those of us who have a hard time finding ready to wear comfortable bras. I just need to grit my teeth and get on with it! Thank you for the great review! I too have been afraid taking on this garment. Bras Always seemed too hard to tackle, since I could rarely find a RTW bra that I thought fit properly! $35.00 sounds very reasonable when the bras I have found have been around and sometimes over $100, so I will give the class a chance now.